“Governments developing their water resources understand the potential benefits but not necessarily the costs in terms of degrading rivers. We can now show these ecological and social costs at a similar level of detail to the benefits shown by planners. This is a new kind of information, not available until the last few years, that helps governments better understand the trade-offs involved in development as they decide on their preferred future,” she says. 31 August 2018: The world’s leading annual water event, World Water Week, organized by SIWI, closed on Friday. More than 3,600 participants from 133 countries attended nearly 300 sessions. Known for its diverse participation from different sectors and countries, participants under 35 were more vocal than ever this year. The 2019 World Water Week will be held 25-30 August 2019 on the theme Water for society – including all. It will move to a new venue, the multi-purpose, Tele2 Arena in central Stockholm. 30 August 2018: Professors Bruce Rittmann and Mark van Loosdrecht received the 2018 Stockholm Water Prize on Wednesday, for microbiological research and innovations that have revolutionized water and wastewater treatment. The prize was presented to them by H.R.H. Crown Princess Victoria of Sweden, at a ceremony in Stockholm City Hall during World Water Week. The research of Bruce Rittmann from the USA and Mark van Loosdrecht from the Netherlands has contributed to the understanding of how microorganisms can transform organic pollutants to something of value to humans and the environment. This remarkable scientific achievement has led to the implementation across the globe of technologies which make it possible to remove harmful contaminants from water, cut wastewater treatment costs, reduce energy consumption, and even recover chemicals and nutrients for recycling. Professor Bruce Rittmann has written over 650 peer-reviewed scientific papers. Together with Professor Perry McCarty (the 2007 Stockholm Water Prize Laureate), he is also the author of the textbook Environmental Biotechnology: Principles and Applications. Professor Rittmann has chaired the Program Committee of the Leading Edge Technology Conference of the International Water Association, where he has worked together with Professor van Loosdrecht. The membrane biofilm reactor (MBfR), a technology that Dr. Rittmann invented, uses naturally occurring microorganisms to remove contaminants such as perchlorate and tricloroethene from water, and has been commercialized. Professor Mark van Loosdrecht’s research has led to the quite widely used Anammox and Nereda technologies for wastewater treatment. The Anammox process is a resource efficient way to remove nitrogen from wastewater. In industries it is used after anaerobic wastewater treatment while in municipal wastewater treatment it is used in combination with sludge digestion. In both cases this results in an energy producing treatment process. The Nereda technology is based on granulation of bacteria, which allows a simpler and cheaper municipal wastewater treatment process. A Nereda plant can be built on a smaller patch of land (>60 per cent less area need) and uses up to 50 per cent less energy than conventional methods. Recovery of high performance biopolymers from the ‘waste’ sludge will contribute to a future more circular economy. 29 August 2018: Two students from Singapore, Caleb Liow Jia Le and Johnny Xiao Hong Yu, won the 2018 Stockholm Junior Water Prize for producing reduced graphene oxide, a material that can be used to purify water, from agricultural waste products. H.R.H. 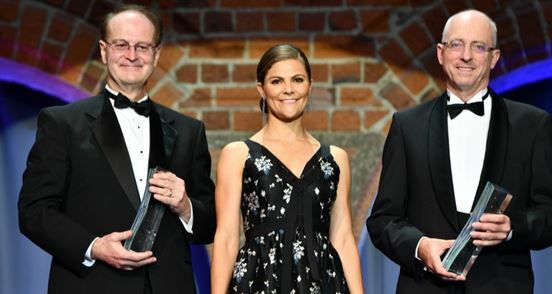 Crown Princess Victoria of Sweden presented the prize at an award ceremony during World Water Week in Stockholm. The Stockholm Junior Water Prize goes to the winners of an international annual competition with more than 10,000 entries from all over the world. The competition brings together young people between the ages of 15 and 20 who have conducted water-related projects of proven environmental, scientific, social or technological significance. This year, 48 national finalists from 32 countries competed in the international final held during World Water Week in Stockholm. 22 March 2018: Biotech pioneers Bruce Rittmann and Mark van Loosdrecht win 2018 Stockholm Water Prize Laureates for revolutionizing water and wastewater treatment. By revolutionizing microbiological-based technologies in water and wastewater treatment Professors Mark van Loosdrecht and Bruce Rittmann have demonstrated the possibilities to remove harmful contaminants from water, cut wastewater treatment costs, reduce energy consumption, and even recover chemicals and nutrients for recycling. Their pioneering research and innovations have led to a new generation of energy-efficient water treatment processes that can effectively extract nutrients and other chemicals – both valuable and harmful – from wastewater. Professor van Loosdrecht’s work echoes this sentiment. His research has led to increasingly common wastewater treatment processes that are less costly and more energy efficient than traditional methods. “With current technology, you can already be energy neutral and there is a lot of research on how to become energy positive. Especially in developing countries with unstable electricity supply and limited access to funding, this is very important. If we could build a wastewater plant that is self-sufficient in energy, that would make sewage plants feasible in many more places,” says Mark van Loosdrecht. 20 December 2017: World Water Week is the annual focal point for the globe’s water issues. It is organized in Stockholm by SIWI. In 2018, World Water Week from Sunday 26 till Friday 31 August 2018 will address the theme “Water, ecosystems and human development”. In 2017, over 3,300 individuals and around 380 convening organizations from 135 countries participated in the Week. Experts, practitioners, decision-makers, business innovators and young professionals from a range of sectors and countries come to Stockholm to network, exchange ideas, foster new thinking and develop solutions to the most pressing water-related challenges of today. We believe water is key to our future prosperity, and that together, we can achieve a water wise world. 31 August 2017: Professor Stephen McCaffrey received the 2017 Stockholm Water Prize on Wednesday, for his unparalleled contribution to the evolution and progressive realization of international water law. The prize was presented to Stephen McCaffrey by H.M. Carl XVI Gustaf, King of Sweden, at a ceremony in Stockholm City Hall during the ongoing World Water Week. The Stockholm Water Prize Nominating Committee recognized Professor McCaffrey’s path-breaking leadership and legal scholarship in international water law. He has made a unique contribution in three specific areas: his seminal work on Treaty negotiation; his major scholarly works, including his book The Law of International Watercourses and; his leadership providing expert legal advice, wise counsel, training and facilitation of complex negotiations with a wide range of stakeholders. 30 August 2017: Two students from the USA, Ryan Thorpe and Rachel Chang, received the 2017 Stockholm Junior Water Prize for their novel approach to detect and purify water contaminated with Shigella, E. coli, Salmonella, and Cholera. H.R.H. Crown Princess Victoria of Sweden presented the prize at an award ceremony during World Water Week in Stockholm. 10 June 2017: The SIWI World Water Week is the annual focal point for the globe’s water issues. In 2017, World Water Week from 27 August till 1 September will address the theme Water and Waste – Reduce and Reuse. Experts, practitioners, decision-makers, business innovators and young professionals from a range of sectors and countries come to the World Water Week in Stockholm to network, exchange ideas, foster new thinking and develop solutions to the most pressing water-related challenges of today. The Stockholm International Water Institute (SIWI) believes water is key to our future prosperity, and that together, we can achieve a water wise world. Women play critical roles in all aspects of water governance, yet they are visibly missing from the water dialogue. Images of women as decision makers, water managers, effective water users and stewards are very hard to come by. Through #WaterWomen we aim to collect images that illustrate these important roles and tell the stories of women as invaluable water managers, decision makers and users. 31 August 2016: Joan Rose, water quality champion, received the 2016 Stockholm Water Prize. Professor Joan B. Rose received the 2016 Stockholm Water Prize for her tireless contributions to global public health; by assessing risks to human health in water and creating guidelines and tools for decision-makers and communities to improve global wellbeing. The prize was presented to Joan Rose by H.M. Carl XVI Gustaf, King of Sweden, during a ceremony in Stockholm City Hall during the ongoing World Water Week. Joan Rose is widely regarded as the world’s foremost authority on the microorganism Cryptosporidium. In 1993, the largest outbreak to date of the intestinal parasite Cryptosporidium affected more than 400 000 people in Milwaukee, US, who got sick from contaminated drinking water. 69 people died in the outbreak. Cryptosporidium, which exists in both humans and animals, cannot be killed by chlorine, and lives for several months. Professor Rose and her team, whom she calls “water detectives” investigate waterborne disease outbreaks globally, to determine how they can be stopped, and prevented. She was the first person to present the widespread occurrence of Cryptosporidium in water supplies in 1988. 30 August 2016: Three students from Thailand, Sureeporn Triphetprapa, Thidarat Phianchat and Kanjana Komkla, received the 2016 Stockholm Junior Water Prize on Tuesday for their innovative water retention device that mimics the water retention of the Bromeliad plant. H.R.H. Prince Carl Philip of Sweden presented the prize at an award ceremony during World Water Week in Stockholm. 23 September 2015: No one is left untouched after having listened to the 2015 Stockholm Water Prize winner Rajendra Singh, also known as the “Water man of India”. He is what most people would define as a true water hero. Since 1991, Stockholm Water Prize has recognized 25 heroes from various fields and continents for their important water work. We know that the world is filled with enthusiasts like these, with a passion to building a better, water-wise world, in any way they can. We now want you to help us find our next water hero. Make sure to give your favourite the chance to win! Nominate in the simple form below. It will not take more than a minute. And do it now, deadlines for nominations is 25 September. 2015 is the target year for achieving the Millennium Development Goals (MDGs). Although considerable progress has been made, the targets to achieve improved access to key basic services during the first 15 years of this century will not be fully reached. About one billion people will still lack access to safe water and even more lack access to basic sanitation. About one billion people will still be without electricity and will go to bed hungry – largely the same underprivileged poor. The challenge remains for the world community in 2015, to formulate, commit to and to urgently pursue a new set of Sustainable Development Goals (SDGs). Water is central to these challenges. Our lives and livelihoods, and that of all other living creatures, depend on water. Without it we cannot sustain a productive economy, live healthy lives or produce food, energy and other basic necessities and commodities. World Water Week in Stockholm will continue to focus on these issues, and the vital role water plays in addressing them. From “water and food security” in 2012, “water cooperation” in 2013 and “water and energy” in 2014 and “water for development” in 2015. Wie wordt de ‘Water Hero’ van 2016? Sinds 1991 heeft de organisatie van de World Water Week de Stockholm Water Prize uitgereikt aan 25 ‘waterhelden’ uit verschillende disciplines en werelddelen. Ook voor de volgende editie zoekt de organisatie enthousiaste professionals die met hun passie een voorbeeld zijn in de waterwereld. Het is tot 25 september mogelijk om personen te nomineren voor de titel. Tijdens de World Water Week van 2015 won mr. Rajendra Singh de Stockholm Water Prize. Singh is de drijvende kracht achter innovatieve waterprojecten in India, waarbij drooggevallen watervoorzieningen worden hersteld en de waterveiligheid in belangrijke agrarische gebieden wordt gewaarborgd. This year, the World Water Week will save 650,000 sheets of paper by making the full conference programme entirely digital. Building increasingly on digital resources also means that, for participants, there are now more ways than ever to access the different features of our programme. The newly re-launched online programme offers participants the opportunity to browse the full conference programme before arriving in Stockholm. Participants also have the opportunity to favourite interesting events and download them to their personal calendar, allowing one to plan events, meetings and social outings well before arriving at the Week. Registered participants can also use the newly launched World Water Week mobile application to set their schedule interactively and engage with other participants. Water is a raging force that floods cities, and a scarce resource drought-stricken communities beg to have. At this year’s World Water Week, nations tackle ways to reuse water and reduce its wastage to help humanity live sustainably. Encouraging global action to support clean water and sanitation, United Nations General Assembly President Peter Thomson today underscored that when it comes to the environment, everything is connected.